I am obsessive about packing light for travel. So when it comes to a kit for travel sketching it must be compact, easy to carry, and functional. There are times when I tuck pencils, paints, markers, pads, and such into my case, just because “I might need them.” The reality is that they rarely get used. Once you find what works for you be judicial about adding new gadgets. Travel sketchers use a variety of art mediums, but I am a pen, ink, and paint guy. If I don’t use paint, then I use just pen and ink. I have markers, but rarely use them, I have tried using watercolor pencils, and though they do give acceptable results I like watercolor best. I suggest you try them all and find what fits for you. There is a B pencil in my bag, it is hard so makes a very light line, good for laying out basic shapes and the hard lead is easy to erase. Most of the time I sketch directly with ink, more on this when we get to technique. The basic choices are some kind of fountain pen or a technical pen, either refillable or not. Water-soluble ink does not work well with watercolor paint so a refillable pen needs India ink, which is pesky to work with and requires frequent cleaning; thus non-refillable works best. Sakura Pigma Micron pens, with black ink, are my first choice. Second choice is Faber-Castell. I have had occasional problems with Microns leaking in flight, however the ink and feel is superior to any others that I have tried so I stick with them. I carry three sizes of pens – .005, .01, .05. The .01 is the primary pen, the .05 is for making notes on the sketches, and the fine .005 used when there is facial detail that does not work with the larger of the two. 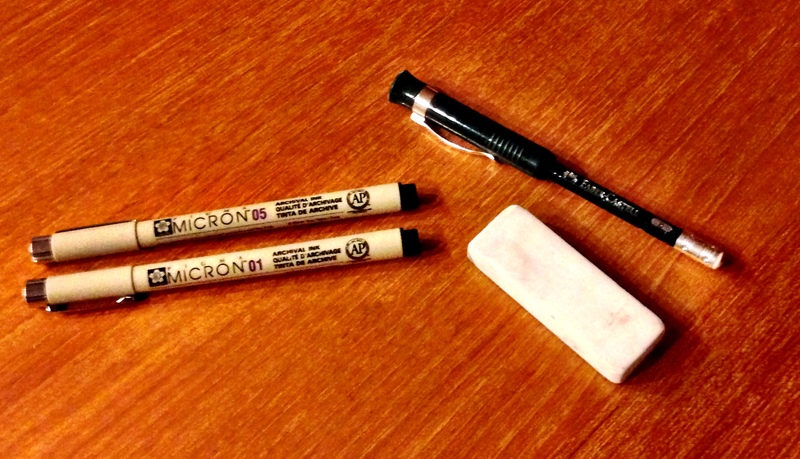 Many times the Micron .01 is all I have with me and it has served me well. It also is my go to pen when I am doing an ink drawing with no color. Watercolor paint has the advantage of being portable, and a little goes a long way. The choice is tubes or cakes/pans of paint. I prefer cakes, tubes are difficult to use when sitting on a stool, or balanced on a rock. Also tubes of paint are categorized as liquids for air travel and this adds to the bother. The easiest solution is to by a prepackaged travel watercolor set. These range in price from reasonable to expensive. 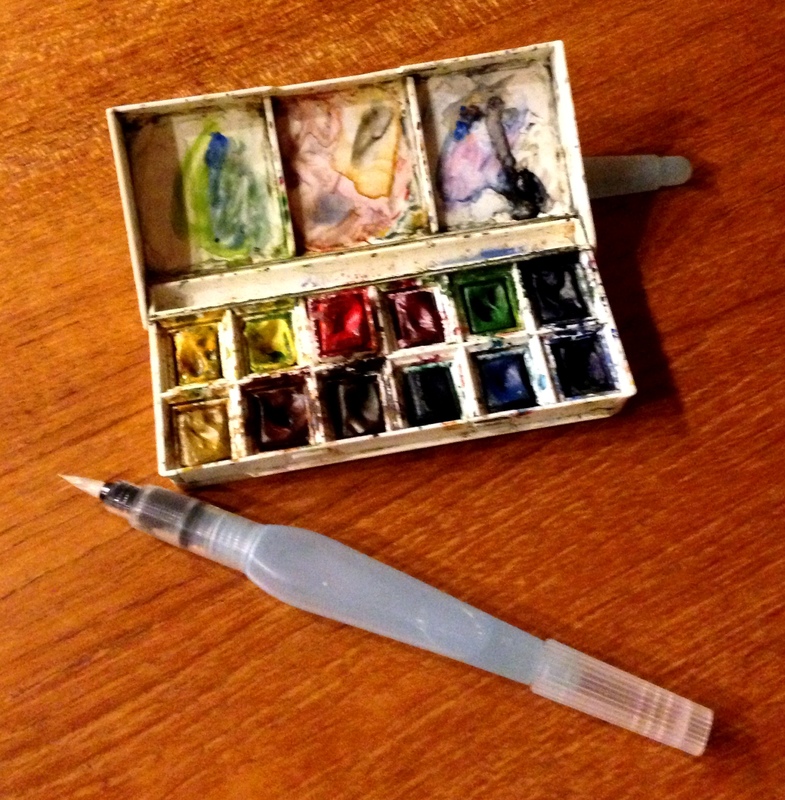 I use Winsor Newton 12 color travel painting set. The quality is fine for travel sketching, replacement pans easily available, and compact enough to meet my small and light criteria. You can go less expensive and make your own sets using metal breath mint containers. The large size can hold 10-12 colors, or 8 with room for a short pencil and brush, the mini-mint tins can hold about 5. That may not seem like a lot, yet I find that 80% of what I paint comes from no more than 6 colors, so I probably could survive a few sketches with the mini, and it is so small. Remember, we are travel sketching here, not studio masterpieces. This entry was posted in ink, pen, sketch, Tips for the Travel Sketcher, Travel and tagged how to, painting, sketch, travel-sketch. Bookmark the permalink.